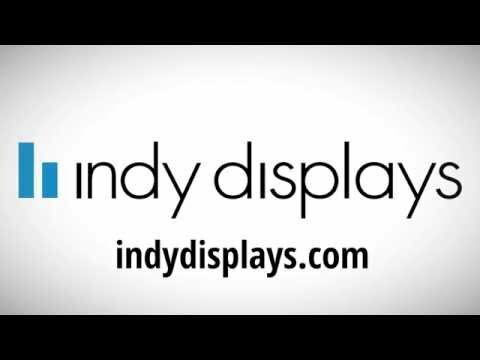 Indy Displays has offered affordable portable display solutions in Indianapolis since 2008. 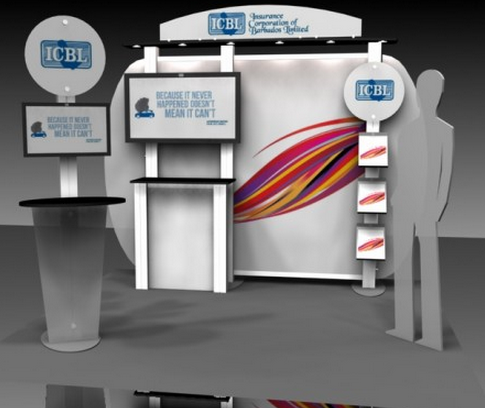 Each year we add the latest portable trade show display designs available on the market. Not only are Indy Displays portable display options budget friendly, but they also are built by the top trade show manufacturers and trade show graphic houses in the United States. Choose from portable table top displays, 10ft portable displays, 20ft portable displays, and 20′ x 20′ custom portable display layouts. The Waveline also known as the Wavetube tension fabric display, started gaining popularity in 2012. Still a relatively new display line, the waveline and wavetube display system is continuing to add new accessory options including multi-media solutions. 10×10 waveline displays can now hold up to 32″ monitor and can easily hold a single or multiple iPads that mount on the aluminum frame. Set up is very simple. The lightweight durable aluminum frame pieces simply snap together following simple instructions. The trade show graphic mural is a dye sublimation tension fabric piece that slides over the frame and zips on one side to lock the mural and put extra tension on the graphic to prevent any wrinkling. Waveline and Wavetube displays can be turned around in as little as a week and can easily be checked at the airport and setup by one exhibitor. The best word to describe pop up displays is “Reliable”. 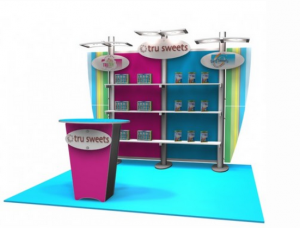 The traditional pop up display revolutionized the trade show industry becoming the first portable display to hit the market decades ago and is still a popular choice for many exhibitors today. 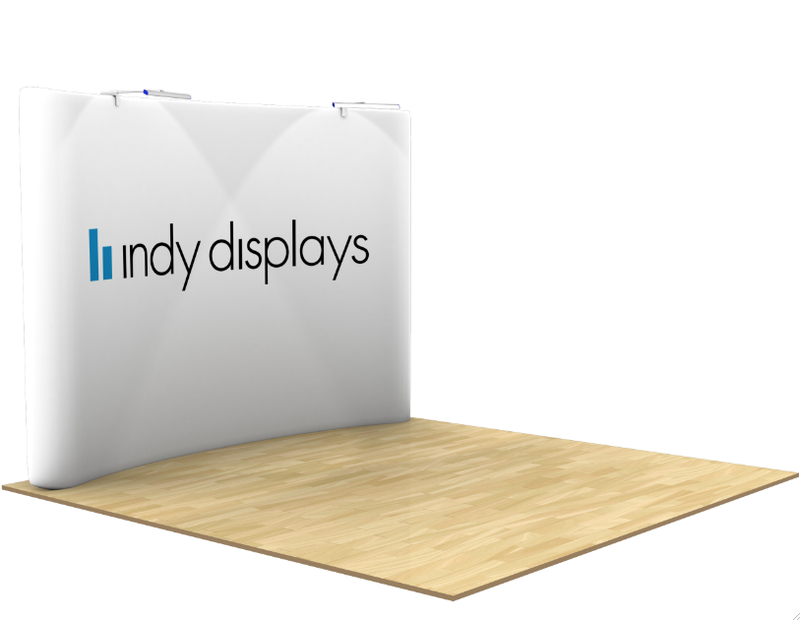 Indy Displays offers a premium pop up display that has been a top seller for years. Not only because of the reliability, but also due to the lifetime warranty. This lifetime warranty doesn’t only cover manufacturer defects like most pop up displays you will find online, but it includes a lifetime warranty on usage as well. What this full warranty means, is that the frame and magnetic channel bars will be covered no matter how or when they are damaged. We have clients that have had shipping carriers damage their pop up frame many years after purchase and get it replaced free of charge. In addition to the traditional pop up display, tension fabric pop up displays continue to grow in popularity. These portable displays include a traditional pop up frame with a tension fabric mural graphic attached making set up a breeze and only taking seconds! Choose from table top options all the way up to island exhibit kits. Frames are available straight or curved. 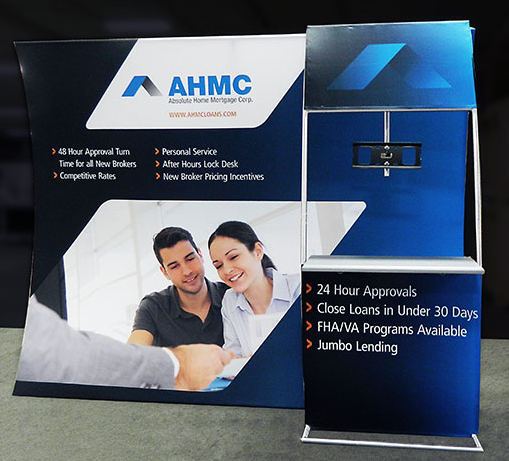 Retractable banner stands are a simple clean way to create an eye-catching trade show back wall. Customers also use these units for retail solutions or for smaller events where booth space is minimal. 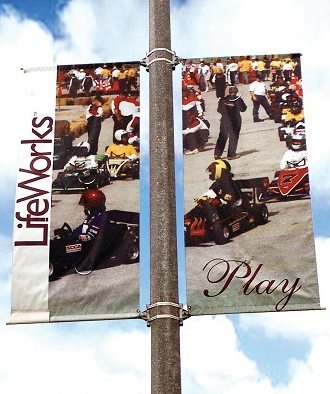 Retractable banners can include many types of graphics. 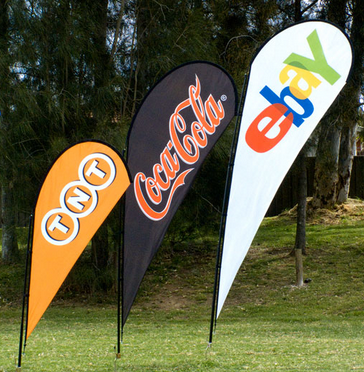 Most of the low cost options you see online include a simple vinyl banner with the retractable hardware. Vinyl banners will get the job done, and we offer this solution with most of our standard and economy banner stand solutions. However, the best route to take is upgrading to a premium graphic option for your retractable banners. 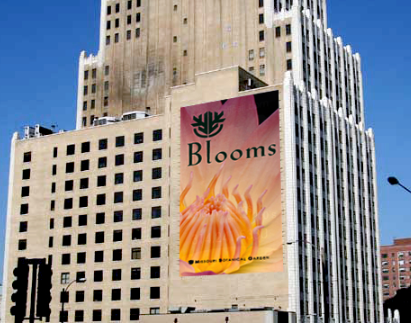 Our best selling premium banner solution is what we call the “Diamond Finish”. This is a dye sublimation graphic printed on poly knit with a thin laminate backing added. What this combination creates is an opaque blocking behind the graphic to ensure your images and colors pop under lighting. In addition, the laminate backing keeps the banner flat for life without the worry of your banner having the sides curl on you. Our Formulate Trade Show Displays have now been one of our top sell display lines for two years. With regular updates to the designs and kit offerings, clients have added more than one unit to their exhibit catalogue. Not only do these outstanding displays set up easy and save on shipping, Formulate displays are clean, modern, and professional looking from the table top version to 20′ x 20′ custom combination kits. The display frame is made out of light weight durable aluminum that includes a series of pieces that simply snap and lock together. The graphics are printed on wrinkle-resistant poly knit fabric are are printed using the dye sublimation printing process. A zipper is attached to each pillowcase graphic that is available in single or double sided that simply slides over the frame and tightens by quickly zipping up one end. As you can see from our Youtube setup video, laying out the display pieces, putting them together, and sliding the graphic over the frame is a breeze! Another outstanding feature to this exhibit line are the accessory options. Create a custom look by adding stand off frames that can hold aluminum brochure holders, laminate shelves, or monitor mounts. Add two or even three monitors to the 10′ x 20′ Formulate Displays to create an affordable multi-media exhibit. 20ft Formulate Displays do not have to just be inline solutions. 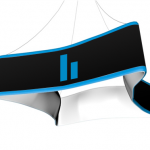 Design a 20ft serpentine frame to have a double sided graphic and multi-media on both sides. This serpentine layout is ideal for 20′ x 20′ booth layouts along with large solutions. The Formulate line even allows you to add a monitor to the table top kit. As mention before, simply add a stand off frame to the table top kit to hold up to a 24″ monitor. If requested, we can customize the table top display to hold an iPad, iPad mini, or Surface 2 tablet. The Formulate table top display is available with four frame styles, the flat, vertical, horizontal, and tapered style. All table top formulate displays can be shipped in 3 to 5 business days upon artwork approval and quantity discounts will be added to orders of 3 or more. 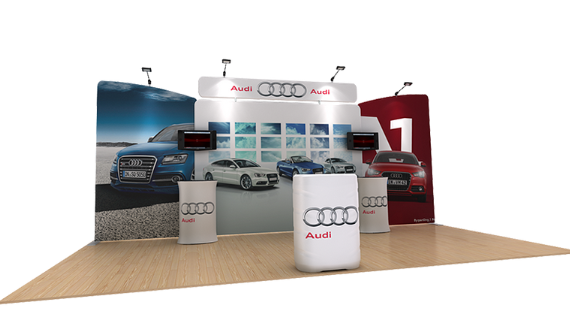 Out of all the Formulate Trade Show Displays, the 10′ x 10′ kits are our best sellers. For one, 10ft booth spaces are the most common, but in addition Formulate Displays offer some of the most affordable customizing for 10ft booth spaces. Plus, 10ft Formulate Displays are eye-catching exhibit kits. Almost any custom feature is possible that includes, laminate shelving, monitor mounts, iPad attachments, suspended literature holders on cables, stand off graphics including custom cut headers, and kiosk stations. Add one of the Formulate trade show counters to complete the booth. Out of the three frame shapes (vertical, horizontal, straight, serpentine), the vertical formulate frame seems to be the most eye-catching. As you can see in the image below, the vertical frame gives you a unique design, depth, and the most custom capabilities. 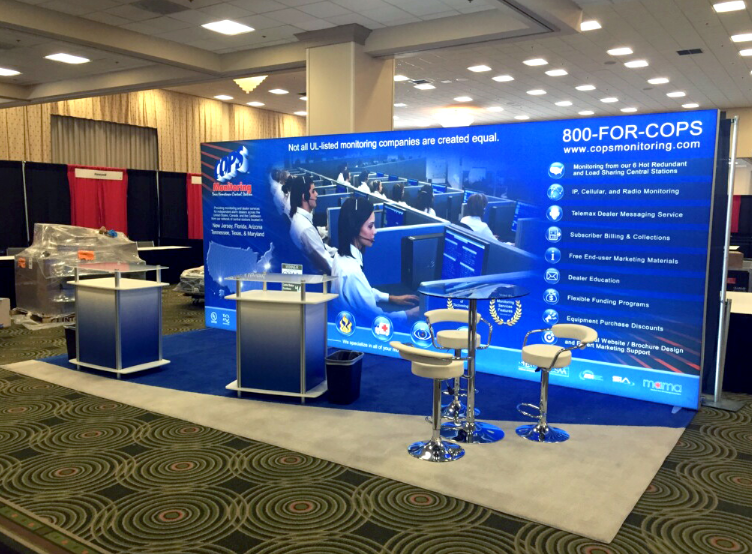 One thing about the 10′ x 20′ Formulate Trade Show Displays is that they can be used in large booth spaces. Most of the time they are utilized in a 20ft inline booth space, but exhibitors have used them in 20×20 island display spaces and even large solutions. Double sided serpentine Formulate Displays work great in an island exhibit if you create a double sided graphic. Like the 10ft Formulate Displays, the 20ft kits include vertical, horizontal, straight, and serpentine frame kits. All 20ft Formulate tension fabric kits can be shipped in 5 business days upon artwork approval. All of our Formulate Display Trade Show Displays projects can include custom renderings and email proofs prior to printing so you know exactly what your trade show booth will look like before receiving it. In addition, each display order will go through our quality control department and be set up before shipping to insure the display is completely functional. Please contact us for more information on the Formulate Displays or other portable display options. The Waveline Media Trade Show Display brings something new to the industry. They are not only portable like the original Waveline Display, but they are a unique combination of custom modular capabilities with ultra portability. The display hardware offers multimedia solutions including monitor mounts and iPad attachments. The Waveline Media Display is a great solution for companies that want one display system that can reconfigure into different sizes and layouts. You can easily use this display in a 10×10 booth space for one show and then use it in a 10×20 booth space for another. It is even possible to create effective 20×20 island display layout by adding a tension fabric hanging sign. The frame of the display is similar to that of a hanging sign. 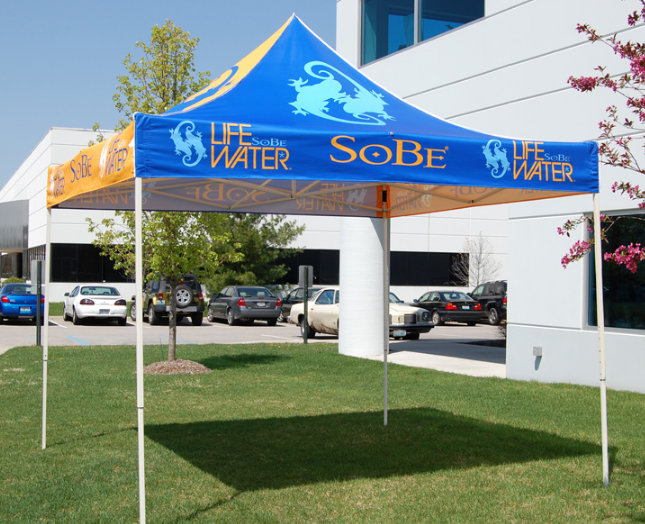 It consists of aluminum tubing and tension fabric pillow case graphics making setup a breeze. This booth has everything most custom modular displays offer without the setup hassle or expensive shipping costs. Why are people using hanging trade show signs? 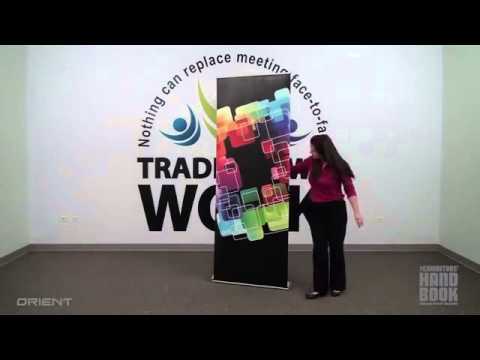 Why do we suggest using hanging trade show signs? The objective of exhibiting at a trade show can vary but generally it is to promote yourself as well as your business, to gain clients, and drive sales. The objective of the trade show display is to draw people towards your space, to keep them there, and make you look professional and stand out from the crowd. Adding some depth to your booth space can help attract people into your booth space from the walk way but what if you want to attract people from across the room or conference center? This is where hanging trade show signs can help you achieve your objectives in a way other products can’t. You don’t have to worry about sight lines taking away from your brand with a hanging sign. This also adds another dimension to your trade show display, height. Once you’ve made the decision to add a hanging sign to your display, you will still need to consider a few things. What shape will work best with your space and design theme? What size will you need? Do you want the capability for the sign to rotate? We have a variety of shapes to fit all your needs, from a circular design, tapered circular (larger at the top, smaller at the bottom), ellipse oval, three varieties of triangle (regular, tapered, and curved), square, and a curved square design. The sizes available are different for each shape, but typically come in three different lengths and widths but may vary by product. The signs can range from 8 – 15 feet long and 14” – 48” tall but will vary by the shape. These products pack a big punch but are very portable and easy to assemble. side your logo is facing. Exhibitors comment on how the rotation of the hanging sign not only looks great but also draws a lot of attention from prospective clients. The rotating motor comes in three different sizes to go along with the size of the sign, the larger the sign is the larger the motor capacity needs to be. No matter the size, the standard rotating speed is 2 RPM. Companies spend a lot of time and money trying to differentiate themselves from the competition. Hanging trade show signs are a great way to differentiate yourself from the competition at the perfect time, in front of a large grouping of your top potential clients. CLICK HERE to visit our Hanging Trade Show Signs page. What if you want to attract people from across the room or conference center? 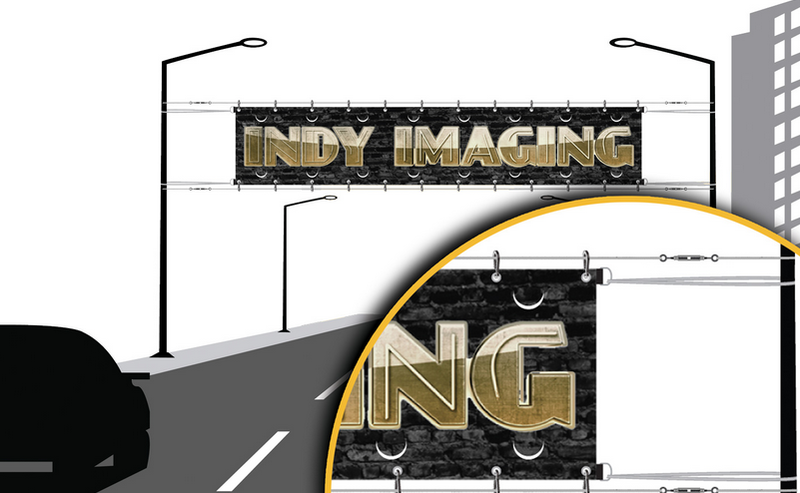 Indy Displays, a leader in trade show displays and banner stands, is now featuring and promoting the XRline. This turnkey product line is fully customizable, easy to put together tool free, and extremely portable. With this manufacturer you know you’re getting the best when it comes to quality with excellent design. The XRline allows you to customize your trade show display by adding monitor mounts, custom lighting, literature racks, counter and kiosks along with many other options. Business executives and entrepreneurs alike love the lean and strong lines. This look will draw attention to your booth and help attract new clients to your booth space. This XRline kit is a 10×10 display that features a custom back wall with dye sublimation graphics, attached laminate counter and monitor mount. This kit also features a standalone custom laminate counter that will add depth and a welcoming feel to your booth space. This XRline kit is a 10×10 display that features shelving to display your newest or best products. You can adjust the configuration to remove or add additional shelving to fit your needs. As with other kits, this comes with a custom back wall with dye sublimation graphics, a detached locking laminate counter, three halogen down lights, custom printed wings, and four customized header pieces (three on back wall display, one on counter). This XRline kit is a 10×10 display with an oversized header graphic to attract attention to your brand. This kit boasts two monitor mounts, one detached and one attached to the main display. The monitor mount on back wall can hold a monitor up to 55”. The custom detached kiosk will allow you pull customers into your booth space. This kit also includes custom wing panels, additional custom headers, a laminate counter and literature racks on the main display. This is a very interactive kit and looks complex but is a quick and easy set up, which is characteristic of the XRline products. Participating in trade shows is a helpful tool for your business. It allows you to successfully deliver your message to your target audience and to your new customers. It also gives you the edge over competitors as you let your customers experience your products and services first hand. A trade show is a perfect venue where you can maximize your exposure and enhance your potential as the industry’s key player. Your participation will allow you to discover other opportunities for your business’ growth and expansion. Joining a trade show is not merely an exhibit of products. You need to have good and customized materials for your exhibit. Your business’ identity and messaging should be reflected by your trade show display, thus, you need to ensure that you have the best display items. We can provide you with all your customized trade show display needs. We will offer our expertise in the field of trade show displays to ensure that your company’s exhibit will stand out in a pool of companies. Pronto Retractable Banner Stand. 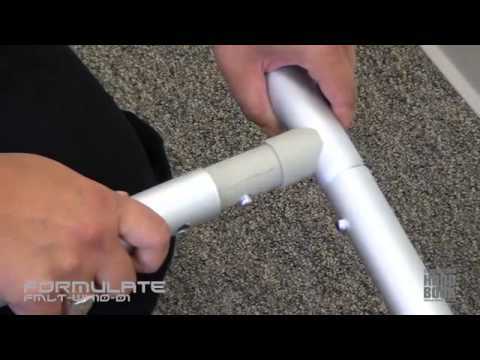 The Pronto Retractable Banner Stand is very easy to set up and you will need minimal time to do this. This is a high quality banner stand that you can get for an affordable price. Once you have identified where you want to display the banner, all you have to do is to attach the pole perpendicular to the base and pull the banner up to attach to the top of the mast. A clamp style top hanger will hold the graphic banner in place. Rest assured that this has a tight grip and the banner will stay in its place until you need to pack it up. The graphic will retract into the banner hardware once you are done using it. 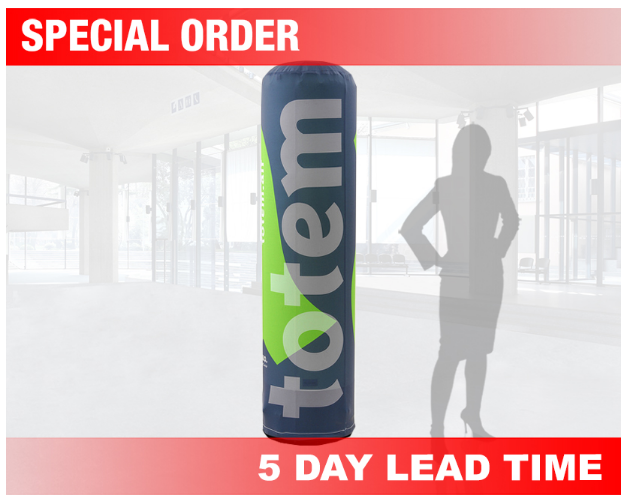 In terms of storage, you will enjoy the feature that the banner stand pole is stored in the base of the unit. Pronto has three segments that you can use for your other display options. Of you want to use it as a table-top display, all you need to do is to assemble it higher. It comes with a black full padded canvas carrying bag. Another good thing about Pronto is that it comes with a Lifetime Warranty. Duo Hello Banner Stand Kit. The Duo Hello Banner Stand Kit is the most portable trade show display solution available in the market. The kit includes a portable shipping case with two retractable banner stands and a counter conversion kit. You can also change banners conveniently with its interchangeable graphic feature. Backwall Retractable Banner Kit. Using the Backwall Retractable Banners Kit is a convenient and easy way to add a backwall graphics to your display booth. 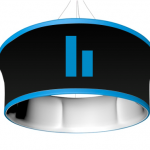 You can create a 10ft or 20ft backdrop from a retractable banner, depending on your booth space. 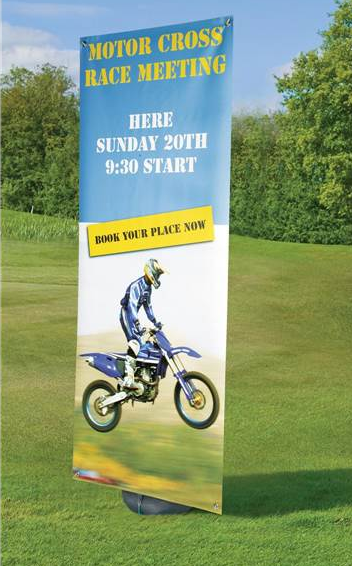 Premium Rollup Classic Retractable Banner Stand. 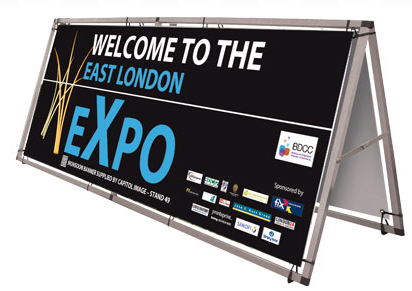 The Expolinc Rollup Classic banner stand is the most reliable interchangeable banner stand on the market. The swedish made hardware is sleek and stylish. Plus it comes with a lifetime warranty on usage. If the banner stand hardware ever fails, then it will simply be replaced. Key players in the industry have grown aggressive in securing their own market share. Entrepreneurs have created ways on how to leverage their own strengths as they also seek ways on how to expand their current customer base and how to maximize all the other opportunities that are present in the market. One of the identified ways that is deemed to be effective in achieving all of these objectives is joining trade shows. Trade shows showcase and highlight the participating companies’ products, services, and offers. Participating in trade shows gives you the opportunity to capture your target market. Just as much as the market has evolved through the years, trade show exhibits have also evolved as modern strategies, methods, and materials have been created. More display platforms and techniques have been introduced. What is the Exhibit Line Display? 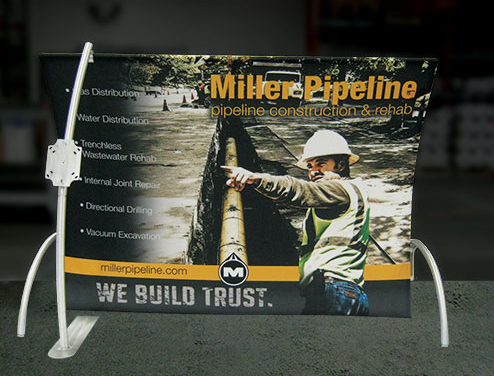 The Exhibit Line Display is one of the most popular innovations in trade show displays. It is a modern-looking exhibit that is made from aluminum and laminate exhibit display hardware. Trade shows usually require a minimum amount of manpower for the display set up and for the actual exhibit. For companies who want to be cost efficient with their display package, the Exhibit Line is a good option. It is portable and is very easy to set up and you do not have to compromise your exhibit’s aesthetic appearance. The entire Exhibit Line’s product range is designed to be set up without the need for tools. The best and most in demand feature of the Exhibit Line is its ability to give your exhibit the modern and trendy look that will surely make you stand out from the rest. Its structure is made from custom modular aluminum extrusions that will give your trade show display the contemporary and corporate vibe that will attract new customers and will please your existing clientele. The kit includes a custom flat laminate canopy that can hold 6 halogen lights. You just need a 48.25T shipping case as your package for the entire trade show. Weighing only 56 lbs., the Exhibit Line Display is undeniably one of the most sought after trade show display systems today. The Exhibit Line Display uses a dye sublimation graphic that is printed on poly knit fabric. The ability of this graphic is to sketch between the main custom modular extrusions without leaving fabric wrinkles once you already display it on the frame. Another key feature of the Exhibit Line Display is its Green Display System wherein we use our eco friendly facility to ensure that the Exhibit Line product range is manufactured with minimal waste by using sustainable or recyclable materials. This is our own way of paving the path for a green and sustainable future. Tension fabric graphics deliver high quality color and images. Fabric graphics are much less expensive than laminate graphics. Tension fabric graphics are very lightweight and easy to pack and ship. 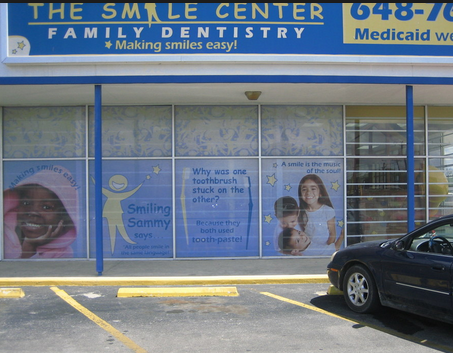 Fabric graphics are much easier to maintain and can last much longer than laminate graphics. In addition, fabric does not chip, dent, or delaminate. The most common tension fabric display system is the tension fabric pop up display. It’s simply the combination of a fabric mural graphic and traditional popup display frame. Below is an example of our popular tension fabric popup display. This display system can easily pack into a canvas bag or a portable hard case. In addition, you can choose to add the case to counter conversion kit which will include a fabric graphic that place over the case/counter. 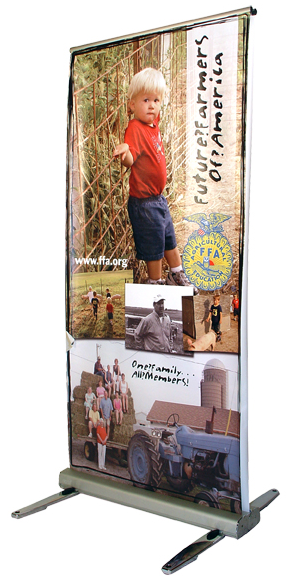 Our popular Exhibitline Display system features a tension fabric mural graphic. Each graphic has silicone beading attached on the sides that fit into the aluminum frame giving the display a seamless and wrinkle free look. This printing process is also simple and relatively inexpensive so replacement graphic murals or additional murals can be purchased and delivered with 2-3 business days. Whether your display is a simple tension fabric pop up display or a custom display that features tension fabric graphics, you will find that using this printing style will make exhibiting much easier on you and your exhibit team. Trade Show Kiosks continue to grow in popularity. 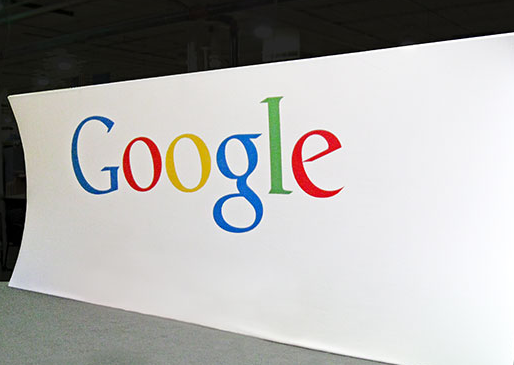 These days it’s very important for most companies to incorporate media into their trade show booth space. With such a high demand, trade show manufacturers have increased their trade show kiosk options in 2013. The Exhibitline Display Line has really added attractive designs to their product catalog! Below are few portable products that we have had a great response on this year. This is a great portable kiosk option! In addition to the attractive design, this product includes locking storage with shelving. The monitor mount can hold up to a 55″ monitor. The entire unit will break down into one case. This option can also be used as a retail kiosk. Simple yet effective trade show kiosk with a competitive price point. This unit can also hold up to a 55″ monitor. Choose from 5 stock laminate options for the counter top and base. This display will easily fit into one case leave use plenty of additional room for product, banner stands, literature stands, or CPU. This is a fusion of attractive design work and functionality! 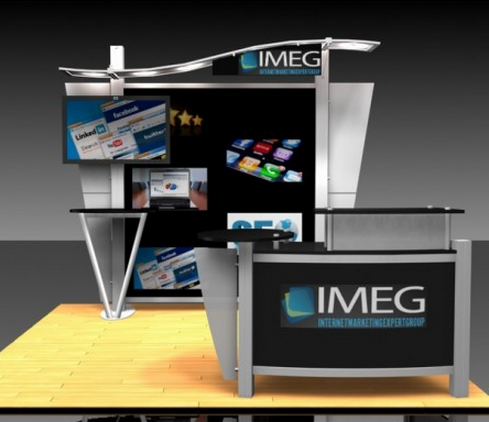 This portable kiosk is perfect for any small booth space or large booth space. It allows you to feature 2 iPad’s along with a small laminate shelf in the center. Easily fit 2 units in one hard shipping case. Contact us today at 317-565-2255 for more information.